Copyright Litigation Handbook 2011 Is Out! For more information about the contents and reviews, check out the slideshare here. Today the Copyright Litigation Blog has been in existence for five years. 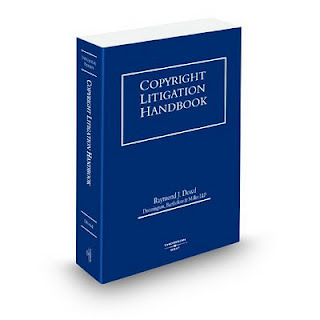 It was launched as an adjunct to my book Copyright Litigation Handbook (West 2010). Over the years my posts have changed in character and style and I have tackled a few subects outside the purview of copyright litigation. In 2005 I took on Bakalar v Vavra which became the first Holocaust-era art trial in a US federal court. Accordingly my practice and blogging took on the topic of art theft. I am now on my second trip to the Second Circuit on Bakalar v Vavra. The Copyright Litigation Handbook has grown in depth and subect matter over time as well. It garnered top reviews in the New York Law Journal, on Amazon and many practioners from around the country have expressed their appreciation for a book that they find practical. I use it almost daily in my practice and update it annually. The Copyright Litigation Blog has also broken many stories both in the blogsphere and in the mainstream press. I am thankful to those who have quoted me and have appreciated those journalists who have consulted me. Being bombarded with tough questions is helpful to me in keeping up with what is going on. I have also received speaking invitations as a result of blogging as well as invitations to write articles. I have made numerous blogging friendships and good acquaintances. A few scuffles over time, but heck life would be boring if we all agreed all the time. I hope no one holds a grudge. People always ask whether I have gotten clients through blogging. The answer is yes. It is a powerful medium for the new generation and it has added significantly to my firm's bottom line. I have gotten referrals from both local and foreign attorneys, been hired as local counsel, been hired to consult or litigate in faraway jurisdictions, and been approached directly by good clients needing quality service. When I started blogging I knew that this would be a powerful medium. I am persuaded that it is growing in power in a way that can be felt almost on a monthly basis. It has been a great experience to be involved and as each post goes out, I can only imagine who it will touch and who will be affected by it. They say that only a tiny percentage of those who read give feedback, I suppose that this is a good thing since the feedback has been overwhelming and overwhelmingly positive. I have posted rankings showing the Copyright Litigation Blog to be in the top ranked IP blogs by traffic and relevance. I don't try to keep up with breaking news all of the time and my blogging tends to be seasonal. When I am updating my book, I blog a lot. When I am really busy with work or just plain lazy, I don't. The guilt-free and subjective formula seems to have worked out just fine. If you Google or Bing "copyright litigation" the Copyright Litigation Blog is the number one result. I hope that is in part a reflection of quality and relevance but I know that it also is a reflection of quantity and perseverance, which are not necessarily the best characteristics to showcase on the internet. Still I am thankful for the standing. In a competitive profession, it is nice to be number one, however fleetingly and whether or not it is deserved. A change in the Google algorithm and it could all be dust! I am looking forward to the next year and excited about this year's update of Copyright Litigation Handbook. I visited the Copyright Office in Washington DC and am looking closely at the new world of copyright registration online. I hope that you will continue to Like, Retweet and otherwise refer my posts to those who may be interested. Feel free to follow me on Twitter @raydowd. I hope to keep you informed, entertained and occasionally outraged in the years to come.